King penguins Thelma and Louise, who are believed to be a lesbian couple, have had a close bond ever since they first met eight years ago at Kelly Tarlton’s Sea Life Aquarium in Auckland, New Zealand. In an early Christmas gift for the couple, Thelma recently laid an egg, reports New Zealand news service Newshub. Both Thelma and Louise have been taking it in turns to incubate the egg at their feet, as they wait until it hatches. “They really enjoy having an egg—like any animal, they want to breed,” penguin keeper and team leader Laura Seaman told Newshub. Although king penguins generally find a new mate for every breeding season, Thelma and Louise have been inseparable for years. However, penguin keepers are now speculating over whether Thelma has been unfaithful to Louise. Lesbian penguin couple: Has Thelma been unfaithful to Louise? 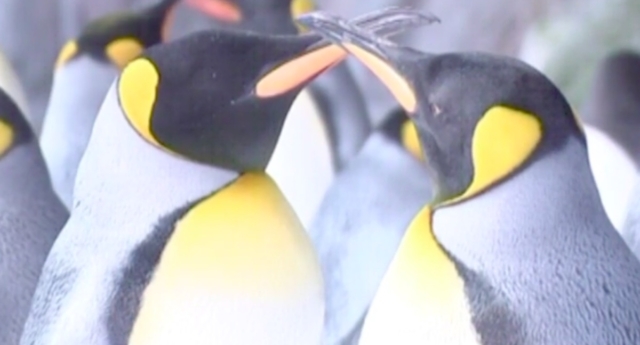 This is because king penguins lay fertilised eggs when a male and female mate, unlike some other birds where the egg is fertilised after it is laid. “[In mating season there is a] lot of courting behaviour, singing to each other, chattering their beaks,” said Walker told Newshub. The penguin keepers are now waiting until early 2019 to find out if Thelma and Louise’s egg is fertilised and if it will hatch. In April 2017, it was reported that Thelma and Louise fostered a chick after it was abandoned by its biological mother at the aquarium. Thelma and Louise’s latest baby news comes after a Gentoo gay penguin couple, who adopted an egg, hatched their baby chick, Sea Life Sydney Aquarium announced on Friday (October 26).